I’ve gotten a little done on the pears. Here they are, all basted down. 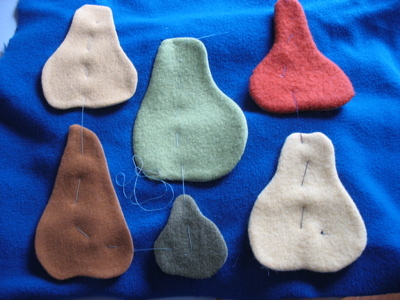 They are made from 5 wool recycled sweaters and one piece of woven wool. and now they are sewed down. That’s a piece of cashmere that they are sewed onto, from my Mom’s stash. I’m sorry about all the problems with the blog and comments and all. Hopefully we will figure out a way to get things running smoothly and consistently again. 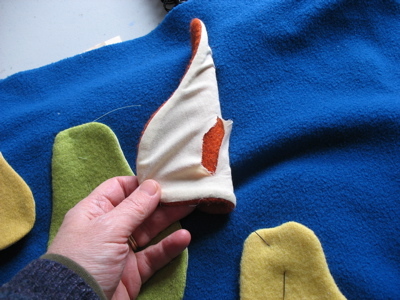 This entry was posted in applique, General, other projects, progress report by mimik. Bookmark the permalink. i can’t remember, what is this herd of pears going to be? 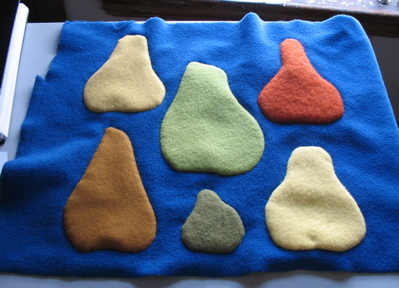 do you have a good Massachusetts source for wool sweaters for felting? I was looking at a Salvation Army and they’re all $5, and I just can’t pay that for a sweater I’m going to shrink! I love how you they look! Usually I see fleted stuff and because of the no-fray edges, they are left raw, but this finishing, adds a great soft, sculptural quality. Can’t wait to see more! Gorgeous pairs, your use of recycled stuff is always inspiring.